The dwarf sperm whale is the smallest of three species in the sperm whale family. Like the pygmy sperm whale it is able to excrete a brownish substance when frightened. Its purpose is thought to disorient and confuse predators. The species is rarely to be seen in the ocean due to their timid behaviour. They are quite shy and don't approach boats. 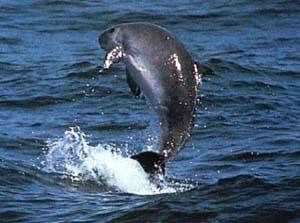 They live in temperate and tropical waters around the world.